CALLING ALL ENTREPRENEURS AND BUSINESS MANAGERS!! BRING IN THE NEW YEAR WITH A BANG FOR YOUR BUCK AND PROMOTE YOUR BUSINESS AT THE COMMUNITY BUSINESS FAIR ON JANUARY 29, 2011!!!!! Please forward this email and spread the word of great opportunity to others!! 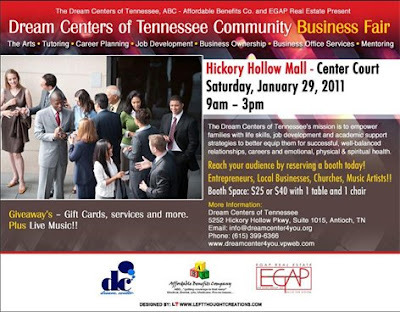 Where: Hickory Hollow Mall - Center Court When: Saturday,January 29, 2011 Time: 9:00 AM - 3:00 PM Click Link for Further Information and for an Application To Rent a Booth for This Great Event! Channel 5 News Associated Press - December 27, 2010 4:05 AM ET NASHVILLE, Tenn. (AP) - Runway 2C-20C at Nashville International Airport is scheduled to reopen Wednesday. The runway and associated taxiway connectors have been closed since Sept. 7 for pavement rehabilitation. The work included concrete joint clean/reseal, full and partial-depth concrete repair, concrete spall repair, concrete crack repair, asphalt crack repair and asphalt sealcoat. Additionally, the project involved rubber removal and new pavement marking. The runway is 8,000 feet long. LoJac Enterprise did the work. Channel 5 News NASHVILLE, Tenn. - Police are searching for two men involved in a home invasion on Brenda Lane in the Antioch area. Police said three men tried to break into the home around 12:30 a.m. Monday. They first tried to get in through a back door, and then broke in from the front. The homeowner was there and called police. Officers were able to nab one of the suspects at the scene, but two others ran away. K9 officers were out all morning looking for the two men, but police think they may have gotten away in a silver or gold Pontiac Grand Am. If you have any information, contact Crime Stoppers at 74-CRIME. District 29 Residents gather for food feast! Thank you area merchants! Ricky Martin, a District Alliance favorite, adds music to the well attended event. Thank you Ricky! Nothing like a great conversation with your neighbors. New neighbors joined in on the celebration! Welcome! Welcome! Welcome! What a beautiful couple from the Castlegate Association and Civic Group! New neighbors joined in on the celebration! Welcome! Welcome! Welcome! What a spread! So much to choose from. Vivian can't believe that she missed the deviled eggs! Forest View neighbors are enjoying the Christmas Holiday! Have it and they will come! What a great gathering! In this picture, there are three plus one....Oh I just love it. Hey isn't that the baby from the commercial who tries to buy stocks from his baby crib and his Mother comes along and takes away his stock sheets? A celebrity in the making! The "S" girls....Sussey and Stinson! You are great! In this cute couple how many do you see? I'll give you a hint....two plus one. LOL. Congratulations! It's beginning to look a lot like Stinsons...everywhere I go! LOL I must have that party hat Ms. Conley! Another BEAUTIFUL District 29 family. Thank you for your friendship and support! Danguire and friend poses for a photo opt. I think that could be her sister...both with beautiful smiles! Nashboro Woods members excited about the gathering as other association and watch groups fellowship. Now that's the cute Edge O Lake Association family with the cutest little ones peeking through the snowflake! Now they are a cute Sharp family! Little Mr. Bell says "Ahh man again" on the Grand Prize giveaway! Here's another Grand Prize winner of a Walmart $25 gift card. Little Mr. Bell in the back is probably saying "Ahh man!" Maybe next time Mr. Bell. Here's our Grand Prize Winner of of a $50 American Express card wearing her lucky Christmas attire! Ok Phyllis takes care of the prize drawings with a little from our friends and hubby too! Phyllis takes care of the prize drawings! I could not get the whole room in one picture. Oh there are the Lewis of Percy Priest Meadows group. OK so much to choose from at the prize table. Now it's time for the give aways! Thanks Berni and friend for the coat donation..we will gather more! There Mr. Brock. So glad to see you! What a great gathering..I can't say enough. A District 29 favorite, President of the Edge O Lake group, Vicky Tataryn with her husband Jean. Cute red sweater Vicky. Looking forward to seeing you soon! That is truly a sweet and cute Grand Prize winner, Ms. Fusgado. I pray that I spelled that right! I am so glad we had this time together..... Just to have a laugh and sing a song... Seems we just get started and...... we have to say..... So long!!! Merry Christmas and Happy New Year!!! Come and Take the Poll. 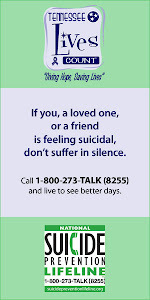 Published by Michael Casson December 17, 2010 in Local and Politics. Gee, that was worth the trou­ble. A few hours after Metro Coun­cil com­mit­tee chairs Megan Barry and Vivian Wil­hoite announced Wednes­day that they had moved a pub­lic hear­ing on Ten­nessee State Fair­grounds leg­is­la­tion from Jan. 10 to Jan. 13 — to avoid a con­flict with col­lege football’s cham­pi­onship game and “accom­mo­date as many cit­i­zens as pos­si­ble” — Barry said the date actu­ally hadn’t been nailed down yet. Today, Barry and Wil­hoite reported back with the new date — no, scratch that: new time — for the hear­ing: Jan. 10 at 5 p.m. rather than 5:30. Yes, you read that right. After get­ting some blow­back from a few upset coun­cil mem­bers, the hear­ing was moved by an entire 30 minutes. From the lat­est Barry/Wilhoite announcement: We appre­ci­ate the con­cerns raised by Coun­cil mem­bers regard­ing the date for a pub­lic hear­ing meet­ing on pro­posed leg­is­la­tion regard­ing the Fair­grounds — Ordi­nance Nos. BL2010-770 and BL2010-820. Based on the feed­back we received, we have decided to go back to the orig­i­nally planned date of Mon­day, Jan­u­ary 10th. We will move the start time to 5:00 p.m. in our Coun­cil Cham­ber in the His­toric Metro Courthouse. Tennessean Investigators are looking for a man they believe has robbed a SunTrust Bank branch twice, including this morning. In both robberies at the 530 Murfreesboro Pike branch, the man goes to a teller and signals he has a gun. He robbed the branch this morning at 8:40 a.m. and on Dec. 6. The suspect is a white man with brown hair in his late 30s or 40s. He stands 5-feet-11 and weighs 170 pounds. 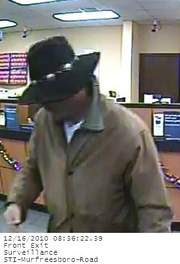 He entered the bank this morning wearing a brown coat, blue jeans and a black cowboy hat. Anyone with information is urged to contact Detective Reggie Miller with FBI Violent Crimes Task Force at 232-7500 or Crime Stoppers at 74-CRIME. An electronic tip can be sent Crime Stoppers by texting the word “CASH” along with a message to 274637 (CRIMES) or online at www.nashvillecrimestoppers.com. Tipsters contacting Crime Stoppers by phone or text message can remain anonymous and qualify for a cash reward. NASHVILLE, Tenn. (AP) — The Department of Commerce and Insurance has reminded consumers about changes in the so-called Medigap law. The department posted a bulletin this week pointing out that eligibility has expanded. Beginning in January, under an amendment to a state law, insurance carriers who offer Medigap plans to individuals 65 and older must also offer those same plans to eligible individuals under 65. Anyone under 65 must be eligible for Medicare due to a disability or end-stage renal disease to qualify. Copyright 2010 The Associated Press. All rights reserved. This material may not be published, broadcast, rewritten or redistributed. Channel 5 News Dec 14, 2010 5:42 PM CST NASHVILLE, Tenn. – Metro-Nashville Public Schools announced they will be open on Wednesday. Noelle Mashburn with Metro Schools said schools will start on time but will operate on a typical half day schedule. High school students will have exams on Wednesday. Middle school semester exams have been postponed until after the winter break. The exam schedule will be announced when students return in January. For a full list of exam schedules, go to the Metro Schools website. WKRN -NEWS Channel 2 NASHVILLE, Tenn. – Light snow and snow showers are expected to continue across the Mid-State overnight Sunday into Monday as temperatures dip into the teens with wind chills near zero. In Nashville, the snow began falling around 12 Noon Sunday. As of Sunday evening, Nashville and surrounding areas reported more than two inches on the ground. Two to four inches were expected in counties to the west of Nashville, with four to six inches forecasted for the Cumberland Plateau. A wind chill advisory is also in effect for most of Middle Tennessee. Wind chills are expected to drop into the single digits to below zero Sunday evening into Monday morning. Monday's high temperature is only expected to be 22 degrees. TDOT is keeping a close watch on road conditions throughout Tennessee. Crews began preparing trucks on Friday evening. "We're putting out brine on fly over's, ramps [and other] places that tend to freeze," said TDOT District Supervisor Burel Tidwell. TDOT and the Tennessee Highway Patrol remind motorists to dial *847 from any cell phone if they become stranded or need assistance while driving on Tennessee roadways. The snow has forced several school districts, including Metro Nashville, to close on Monday. Click here for a complete list. Beginning at 4:30 a.m. Monday, view live road conditions via USTREAM and News 2's Jerry Barlar. Visit NashvilleWX.com for the latest forecast and radar conditions. WKRN - Channel 2 NASHVILLE, Tenn. – The Rutherford County Parade, the Possumtown Parade and the Donelson-Hermitage Christmas Parade have all been canceled due to winter weather. Rutherford County annual's parade was scheduled for Sunday afternoon at 3 p.m. Organizers told News 2 they will not reschedule the annual event. The Possumtown Parade was also scheduled for Sunday. Organizers are planning to reschedule the annual event, though a new date has yet to be announced. The 26th annual Donelson-Hermitage Christmas Parade was scheduled to begin at 4:30 p.m. on Sunday afternoon. The parade will not be rescheduled. Mike Curb: "It's time for Belmont to change"
Associated Press - December 8, 2010 2:45 PM ET NASHVILLE, Tenn. (AP) - Tennessee's November revenue figures show sales tax collections exceeding projections for the eighth consecutive month. Finance Commissioner Mike Morrow said Wednesday that the latest figures are indicative of "what we believe to be a slowly recovering economy in Tennessee." 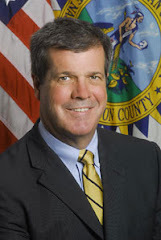 Morrow said sales tax collections were $15 million more than the estimate for November. The State Funding Board was to meet Wednesday to discuss revenue estimates. Copyright 2010 The Associated Press. All rights reserved. This material may not be published, broadcast, rewritten or redistributed. WKRN - Channel 2 News Dec 08, 2010 10:35 AM CST NASHVILLE, Tenn. – Metro police are seeking the public's help in identifying a suspected serial robber. 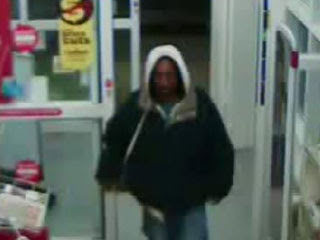 Detectives believe the same man robbed the CVS store located at 4709 Nolensville Pike on Tuesday night and the Walgreen's store located at 2909 Murfreesboro Pike on Monday. He is also suspected of trying to rob the Dollar General store located at 1461 Bell Road on Monday. In all three cases, police said the suspect handed a note to the clerks demanding money and threatening that he had a gun. The suspect is described as a black man in his mid 20s. He is approximately five feet, eight inches tall and weighs 180 pounds In the cases Monday, police said he fled the stores in a green SUV, possibly a Ford Explorer, with a Michigan license plate. Anyone recognizing the man is urged to call Crime Stoppers at 74-CRIME. WKRN Channel 2 Dec 06, 2010 5:55 AM PST NASHVILLE, Tenn. – A fire early Monday morning damaged a liquor store in the Antioch area. A police officer passing by spotted the fire at J.T. Liquors on Murfreesboro Road at about 2:30 a.m. Upon arriving on the scene, firefighters saw heavy smoke coming from the store and had to force their way inside. Firefighters had the blaze out quickly and managed to limit the damage. "It seems like right now, most of the damage is confined to area around the coolers," Nashville Fire Department spokesperson Joaquin Toon explained. "We're thinking possibly that the damage is the result of some electrical problems. Right behind the cooler area and up into the ceiling, there's quite a bit of damage but there's not a lot of structural damage." No one was injured. The cause of the fire was not immediately known although officials initially believed it was electrical. WKRN Channel 2 Dec 06, 2010 8:13 AM PST Updated: Dec 6, 2010 2:10 PM CST NASHVILLE, Tenn. – Metro police are searching for the man who robbed a south Nashville Suntrust Bank Monday morning. 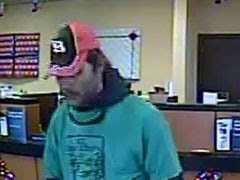 The robbery was reported at about 8:45 a.m. at the Suntrust branch located at 530 Murfreesboro Pike near Fesslers Lane. Officers on the scene said the suspect passed the teller a note demanding money. He also implied that he had a weapon although one was never shown. The teller complied and the robber fled with an undisclosed amount of money. Police said the suspect was wearing a green t-shirt with Ace Building Company written on the front over a dark hooded sweatshirt with jeans along with a NASCAR No. 8 black and red cap at the time of the hold-up. He has brown hair and a mustache and is said to be in his 40s. He is approximately five feet, 11 inches tall and weighs 170 pounds. Anyone with information concerning the robbery or the suspect's identity is urged to call Crime Stoppers at 74-CRIME. Channel 5 news Posted: Dec 02, 2010 5:34 PM CST Updated: Dec 02, 2010 5:50 PM CST MOUNT JULIET, Tenn. – Police said a person has been hit by the Music City Star on the railroad tracks in Mt. Juliet. It happened just after 5 p.m. Thursday at the crossing near Mt. Juliet Elementary School. Police said a person was hit by the train, but it's unclear of any other details surrounding the incident. Mt. Juliet Police issued an alert, but said there were no passenger injuries. MTA has sent buses to transport the passengers to their homes. Channel 5 News Posted: Dec 02, 2010 5:10 AM CST Updated: Dec 02, 2010 7:36 AM CST Dalia Perez ANTIOCH, Tenn. - A 15-year-old girl has died and other children hurt in a house fire early Thursday morning. The blaze started around 3 a.m. on the southeast side and flames were shooting from the house when firefighters arrived. Officials said there were 13 people inside the home on Artelia Drive at the time of the fire. Dalia Perez died in the fire. One child was transported to a local hospital with injuries and another child was treated at the scene. The teen's mother said a space heater could have started the fire. Fire officials are still investigating.